"The on the go solution for posts taht works across platforms and formats"
"It helps enhance my imagery"
What Graphic Design solution do you use? Adobe Spark is an amazing tool for any designer to have in their design toolbox. I personally love their moving graphics over a picture of your choice. You can adjust the font, color, and the movement of the words over the picture. It looks great and professional. It's great for using in ads for online marketing. Try it for free, see if it's for you. I love it. Spark is amazing! I've found Adobe Spark to be of great use in business by using the moving graphics in facebook ads. They make your ad look appealing and completely professional. And if your ads look good and get clicks, that can't be bad for business, not matter what you're selling. "Adobe Spark is the best!" It's extremely useful to anyone trying to up their presence on Social Media platforms. What I like best about Adobe Spark is it's a suite of design tools that anyone can use to create visual content. From designs for social media, and really elegant animated videos. Adobe Spark allows both web and mobile users to create designs for free. While there are alot of different options, their built in templates could use a refreshing. They have had pretty much the same options available since their launch. Also, they watermark all of your projects with the Adobe Spark logo when you use their software for free. They sell you on the fact it's free to use, and then tell you you have to buy a subscription to get the watermark removed. It should say that up front. I love the moving graphics. On more than a few occasions I have gotten a wonderful response when I posted ads on Social Media platforms with the moving graphics I made using Adobe Spark. By wonderful response, I mean people actually seeing the ad, and clicking the link. "I love Adobe Spark and you will too." I am a huge fan of the way my designs look when I use Adobe Spark. The templates offer a variety of colors, fonts, and styles, and they are all adjustable to fit your likes and needs. That's true for everything you can produce using Adobe Spark. Graphic designs that have moving texts are my favorite, but you can make videos that have great soundtracks that pop. It took me a little longer than it might some to figure out how to tweak the settings on the animated videos. The templates were easy to choose from, but learning how to adjust the colors and fonts didn't come intuitively. I'm not sure if i'm the only one or if alot of folks might encounter this same problem, but it took me a while to figure out. Once I did, my designs and videos looked exactly how i pictured it in my head. So, small learning curve there. They could make it easier to adjust the templates. You should try it for free. They offer a paid subscription too to remove their logo off of your work. Adobe Spark has been a wonderful tool to have in my design arsenal. The animated videos have brought a much invited awareness to my social media followers, which has meant more people show up to our events. That in turn means, more ticket sales, and more cash in hand. "Find your creative spark on ADOBE SPARK!" Adobe Spark for the win yall!!! What I like best about Adobe Spark is the limitless amazing things you can do. They offer so much for free, which is my other favorite thing about them. From animated video to a great looking smooth and elegant blog, which is hosted for free, to moving graphics, you can really dig your creative teeth into Adobe Spark and output a nice looking product. The only thing I dislike about Adobe Spark is the fact that they actually put "ADOBE SPARK" stamped on your finished product. If you find it easy to use and like what you can do with Adobe Spark you can always subscribe for a fee. I wish it were free all around, but that's ok. It's not as pricey as other Adobe programs. And if you don't mind the watermark on your design, you can actually just keep on with the free signup. It's a mild complaint for me, not a deal breaker. Get it, try it, buy it. Trust, you'll love what Adobe Spark can do for you! I use Adobe Spark mainly for the motion graphics, aka moving text over graphic. It looks fantastic and makes for a really nice facebook ad. Having something stand out on Facebook can up your clicks and you can convert a potential client into a paying customer. "Adobe Spark is for everyone!!!" I like Adobe Sparks brilliant video options. Their templates will make you shine in a sea of social media ads. You don't have to be an experienced graphic designer, nor a well seasoned video editor to achieve a top notch outcome that is worthy of sharing on all of your platforms that you advertise. Did I mention you can get started for free? Yes...and ADOBE product you can use for free! I like Adobe Spark. I like it very much, however unless you want their company logo on your final product, there is a catch. There's always a catch. Nothing in life is truly free...even the free stuff. Adobe does let you full produce a nice looking product that is water stamped with their logo, and to remove it you must pay them monthly or yearly for an Adobe Spark subscription. Why not try it for free? Get a feel for it. It just may be worth subscribing. I have personally used Abode Spark for all of it's glory and options. It's a must have to make your social media ads pop. In a sea of scrolling, if your video stands out, YOU stand out. It turns leads into clients. "Adobe Spark is great for your design needs." ADOBE SPARK allows you to showcase your ideas, or even a product your selling, using professional looking design options. With creative design templates that you fill in with your info, I like best their animated video options. Before I really knew too much about graphic design, Adobe Spark had my back, making me look like a pro & really helped with my product launch. They also have animated graphics, which are excellent for social media marketing, as well as an elegant website that's even hosted. Plenty of nice templates, easy to use, and free of charge. I like that! 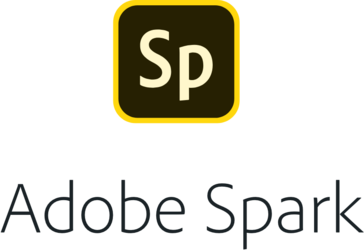 Adobe Spark is free to use, and you can really get so much done for free, however be ready for their logo to be on all of your work. In order to remove the Adobe SPark watermark, that is their logo, you have to shill out some money. It's not as expensive as buying into the Adobe Creative Cloud products like photoshop, however for a product that wears it's freeness as a badge, it could be cheaper, in my opinion. Or actually free. I've used Adobe Spark for almost every option you can at this point, but I think the best way to utilize it is to make a animated video selling what you sell, and posting it on social media. It helps increase sells. "Up your social media marketing game!" First off, I love that ADOBE SPARK is free to use for everyone. With Adobe Spark, you can create an animated video, moving graphics, and even a website to showcase your new product line or ideas. It's set up in a way that you can use it to promote almost anything. A music single release, a business, a book, or even an event. Adobe spark can be used on an app on your smart phone, or on a computer. I love Adobe Spark, and it is free to use. That being said, I dislike that Adobe Spark stamps their logo on any project you finish using their software. Yes, you can remove it, but of course...it will cost ya. While it isn't so expensive that it will break the bank, it does cost some money. If you ask me, they could make more if you could actually pay for a single watermark removal per project, but instead, you have to buy a subscription. They offer monthly or yearly. It might behoove you to get a subscription if it's be used often enough to help promote your business. But the watermark isn't too bad either if you just take the free route too. I have often used the animated video to promote or sell music and then post it on Social Media Platforms. It looks very pro, and get's clicks. It is elegant, but eye catching. It has up'd my audience. "Spark gives you the ability to stand out." Spark gives you the ability to stand out in an instant. You can create beautiful animated videos, resizeable graphics, and web pages and have your social presence, emails and blog looking sharp in a snap! It's easy to use for anyone who knows graphic design or for someone without any working knowledge of it at all. I dislike that Adobe Spark watermarks their logo onto your work. You can pay for a subscription to remove it, and It isn't extremely that expensive, however, it does cost some money. I think they could improve by letting users pay to remove their logo on a project to project basis, but as it stands you have to pay for a monthly or yearly plan. If you use Adobe Spark all the time for your job, I'm sure it would pay for itself. I have used it for social media marketing for where I work. It is great. I've made moving graphics, a blog that looks fantastic, and many animated videos that have had great responses and had amazing returns. "ADOBE SPARK IS VERY VERY USEFUL FOR ANYONE"
ADOBE SPARK allows you to create video, texts that move over a picture, and even a website to showcase your ideas or product. It's a versatile enough platform that you can use it to promote almost anything. A new music release, a book, a business, an event. The options are virtually unlimited. Adobe spark can be used on an app on your smart phone, or through the full website on and computer. The best part? IT'S FREE TO USE!! Admittedly, I love Adobe Spark, and I have successfully used the platform in various forms. The best part? It's free to use. The part that I dislike, is that Adobe Spark puts their logo on all of your work, unless you do a pay subscription. It isn't ALL that expensive, but still, it does cost money. I wish you could possibly pay to remove their logo on that one particular project instead of having to purchase a monthly or yearly plan. If you use Adobe Spark all the time for your social media marketing I'm sure you'd be getting your money's worth, however if you are using it at all sparsely and you don't want their logo on your project, it may not be worth the price to subscribe. I have used Adobe spark in all of it's forms. It's most powerful use is for Social Media Marketing. I have made a video promoting a book I've written. I made another video very recently for a brand music new single I just released. The website you can create for free is even hosted for free. It's an elegant one page setup and you can choose from several very nice elegant themes, and each theme is adjustable and looks great. "Will save any business time and money!" I like the fact that you can produce professional graphic and other artwork without the time and expense of having to use a dedicated graphic designer. In the past, you would have had to compromise on quality to produce graphics like this, but Adobe Spark has changed all that - you can literally create a professional piece of work in 30 seconds! What is also great is that you can use Spark as a mobile or desk top application. Give it a go - it's quick and easy to use and will save you time and money! We wanted to solve the problem of having to pay for the services of a professional graphic designer to produce a piece of artwork that we wouldn't be able to gain any ROI from. Particularly with social media posts, we need graphics that look great, but don't cost a lot of money to create - Spark enables us to do this without having to pass the cost on to our clients. "A little know Adobe tool that rocks"
I really like the speed with which creatives can be designed and manipulated until you get just what you are looking for. There are many presets both in size, shape, and design that you can choose as a starting point or if there is no default that works for you you can start entirely from scratch. I think that anyone who can use a computer can use Spark effectively. It can sometimes be a little confusing knowing how to get a particular effect from the interface options. Having said that, if you do completely mess it up it is really quick and easy to start over. For most people it will be a case of trial and error by simply playing around with the available controls. It's not a biggie but it would be nice to have some more in depth tool tips available. What you can actually achieve with Adobe Spark is a creative that looks far more "expensive" than it actually is. The finished product looks professionally done and most people would think that it had indeed been professionally and expensively designed. We do most of our creative designs in house and although we have other software products that can do the job they are almost always more complex to use and are rather time consuming. Adobe Spark is a quick and dirty creative designer that is relatively easy to use, fast, and it gives a highly polished creative that belies the simplicity of creation. "Adobe Spark has amazing features!!" I love that I can easily log in. select the picture of my choice, and edit it within seconds with my companies logo. It provides me with the necessary tools to tilt and change fonts and even animate! I also have the app on my phone so I can use it from anywhere! I don't have any complaints yet. It is very simple and easy to use which is more than I can ask for. If you're looking for a software that allows you to create high quality marketing ads/pictures, Adobe Spark isa must. It really has everything you need right at your fingertips and allows you to create with ease. It allows my company to add our logo to any video or picture and it also comes with its own symbols. You can see other design features made by different people and remix it to fit your needs best. "LOVE Spark - Just wish it wasn't a web based product"
When I found Spark, it was like that moment where you wonder where has this been all my life! As a social media manager I put out a number of posts a day for different clients on various platforms and sometimes I have to have three different sizes for one post/photo - Spark has been a life saver as it is so easy to switch sizes. The ability to add a brand makes it so easy to use the right colors & type. I HATE that this is a web based product!!! I just want it to be a downloadable program like the other Adobe programs. It takes SO long to upload photos - I've found if I can make it happen the best option is to edit all my photos and store them in Lightroom, then give it a few hours for them to upload to the cloud so I can access in Spark - If I don't do this it will sometimes take upwards to an hour to upload a photo, this is absolutely ridiculous! I also hate that you can only have one brand- I personally manage half a dozen brands (and growing) having to replace the brand every time I use the product is tedious & time consuming. The way it saves is incredibly frustrating as well because I often end up writing over posts I need - I can't create new posts every time because of the problem with brand management. Please just make this a downloadable program, I think it would solve all the problems! I suggest using this product in conjuction with Lightroom and create a process so that you give time for Lightroom to upload your photos you want to use in the cloud. This will save time on upload speeds for sure! Better consistency with social media accounts, ability to quickly & easily create various sizes. "Easy to Use Media Design Tool"
I love that I can make clean, professional looking web graphics and videos with ease! I also love that you can save your fonts, colors, and logos to brand every creation easily and beautifully. It would be super beneficial for me if I could have different brands in folders. As a social media manager and manager of my own photography and blog, I have multiple brands that I'm working with. It would also be nice if there was a little more freedom for creativity in layering and combining images. But I suppose that's what Photoshop is for! It's definitely worth it! Especially if you're already invested in the Adobe community. Social media and appealing, professional, and beautiful images are important in today's market. Don't miss out on easily creating beautiful work that stands apart from others and has your own branding! I am super grateful that I decided to use it. I do want to say that I have not used the stock photography provided by Adobe. So I can't say whether it's better than other design software out there. As a photographer, blogger, it's important to have consistent and visually appealing designs. Spark makes it possible and it just looks so beautiful when your project is complete. "Easy to Learn, Good Results for Simple Projects"
It takes almost no time to create a video or graphic. I've used Spark to make some jazzy content for professional training. I liked that it's easy to add images, video, music and narration to a video, which can be finished and posted on YouTube in less than an hour (if you already have the ideas fleshed out). Adobe offers this for free and you can easily post it on Vimeo or YouTube. A child could put together a video. Videos you include have to be very short, but you can then just continue a longer video by setting it to start later.. It took me awhile to discover how to select different music. I recommend Adobe Spark for business, education or personal use. I used this for training modules inserting the video in an Articulate Rise course. I've found that including original videos offers a vibrant form of proprietary content with little need to call in an expert. "Social growth through mobile art"
De manera sutil, permite a los usuarios crear contenido audiovisual simple y minimalista, no es necesario tener conocimientos sobre diseño gráfico para obtener muy buenos resultados, las herramientas son intuitivas y permiten el uso de la pantalla en una forma completamente nueva. En otra sección es posible eliminar las marcas de agua, las personas pueden decidir si aceptan todo el crédito por el trabajo o lo comparten con la aplicación Adobe Spark, haciendo de esta una aplicación recomendada para el uso de agencias digitales que no sean presenciales o requieran de tener que generar contenido de manera exprés. Convierte cualquier teléfono en una poderosa herramienta de gestión de contenido que puede ser útil para controlar crisis que se den en horarios no controlados, permitiendo el uso de imágenes o videos específicamente diseñados para cada red social. Su gran variedad de plantillas la hacen diversa y fascinante de usar, puede estimular a los principiantes o darle rienda suelta a los más experimentados poniendo a disposición toda una librería que funciona de igual manera respecto a los elementos ofrecidos de manera individual. The most important limitation is that the projects are not exportable to layer formats, so the generated content is subject to only the adobe sparks handler, it would be interesting a software for desktop that can work the same even more tools of adobe sparks for users less experienced with other more robust suites. Improve the document export system locally or via iTunes. "Best App Around For Social Media Images!!!" What is NOT to love? It's easy. It's quick. Simple. I love that I can create images for social media (or numerous other advertisements) in as quick as 10 minutes. Possibly even less. There is no need to sit and create images like this in Photoshop. The template option is phenomenal, stock images are available. I can't say ENOUGH about this app from Adobe!!! Absolutely nothing. This app is easy, quick, and perfect! You will never regret this decision! As a marketing and design company, I am able to save so much time with this app. The benefits of saving time streamlines to saving money. Whether it is creating ads/images for my own company, or someone else's, it's the way to go! Hands down. Time is money. Spark has excellent tools to create social graphics, videos and storytelling presentations in just a few minutes and with satisfying and professional results. In particular, Spark Page allows you to create web pages of great visual impact with the insertion of texts, images and photo galleries. You could insert more layouts to choose from, and I mean both Spark Page and Spark Post or Spark Video, because this would increase the chances of differentiating your work from that of others. These are excellent tools that offer professional results in no time, to create social graphics (Facebook, Instagram), videos (even for YouTube) or web pages of presentation or to create a storytelling. There is still a little something, but I recommend using it. I use mainly Spark Page and Spark Post to create graphics to be used on Facebook or Instagram, or web pages of presentation for my clients, when above all there is to present a new product. "So Simply, No Instructions Necessary"
Though creativity isn't completely sacrificed, full creativity, especially with the "blank canvas" is not this tools strength. Customizing this to share is not the easiest, for example the ability to rename the URL to be able to easily share. Think of an easy way to create a presentation, video, or social media post, with simply and creative tools to create these things. I primarily use this tool as turn-in assignments for my course, which includes a journal, self-studies, and a final portfolio. I am working currently on implementing into my soft skills course, so students can present their spark page to a potential employer. I teach a course that requires a final portfolio. I struggled with how a student should turn this in until I found Adobe Spark. Now I have a paper-less product plus something that can shared to others. I also require a journal. When the students first share their spark link with their first journal entry, they do not have to share that link again when they finish their second journal entry. I only need the link once to grade all their journal entries. "Video, social posts and storytelling"
Adobe Spark is a web application that can be used to create web presentations, videos or social posts, in a very simple way and starting the work with ready-to-use graphic layouts. I think the layouts are still few and maybe it would be useful to be able to use their own fonts within the projects. In general, there could be more possibilities for personalization by the user. It certainly offers fast and effective tools to create graphics, web presentations and videos starting from preset but editable layouts. It would need some more tools, but it is effective and can also count on the smartphone and tablet app. More than anything else I have created graphic posts that I have inserted on Facebook and Instagram. I have also often used Spark Pages for personal presentations to show to my clients. More than anything else I have created graphic posts that I have inserted on Facebook and Instagram. I have also often used Spark Pages for personal presentations to show to my clients. The best part about Adobe Spark is the fact that they have a community full of user created templates that you can edit to produce your own. The fonts are great and the possibilities have so much potential. The absolute worst part about this software is the inability to produce large image sizes. For that reason, it really limits the type of work that you are able to produce on Spark, which is disappointing. You would think for a company as advanced as Adobe, they would implement similar features of their other softwares. Creativity and visual appealing content is a great benefit of this software. You are able to quickly generate professional digital content with the fantastic templates available. "Adobe Spark unleashes your creativity." Adobe Spark is a really great product for designers of all sorts. I like best that they give you the option to create a graphic design where the words move over your picture. They just look so good! I've had more than a few compliments when posting the finished designs on my social media.They are easy to make too. Adobe Spark is the best. I don't love how at the bottom right hand corner of your design, there is an ADOBE SPARK logo. If you're just making something for personal use, it may or may not be a big deal for you, but if you are using Adobe Spark to create ads to promote your business or a product, you very well may want to subscribe. It costs money to do that, but it may behoove you to do so to look more professional. The optics are better in advertising without a watermark on your designs, and that's true no matter what design suite you choose to use. You can easily create very nice and cool looking designs where the words scroll into place over your design, which looks great on a facebook ad. 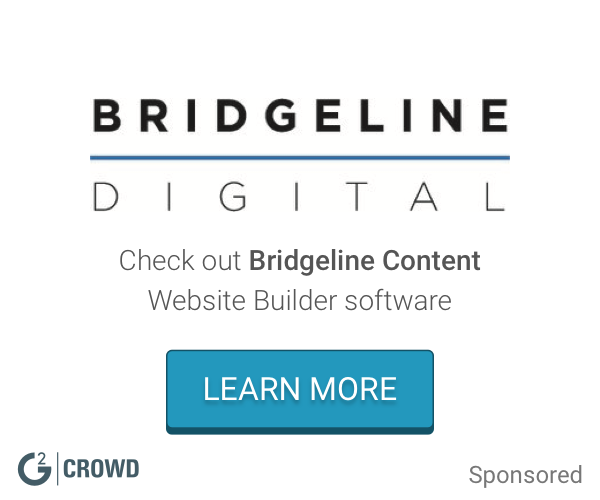 Better ads get more eyes on them, and clicks to your business link. At that point you can hopefully fully convert someone into a patreon of your product. "Versatile Graphic and Page Creator "
I've used Adobe Spark for a handful of projects and believe in the versatility and power of this application. First of all it is very easy to use. You don't have to be a graphic designer or web language guru to create amazing looking projects. For example, rather than a boring black and white resume, I used Spark to create a resume/portfolio of my work that helped me stand out from the competition. With a few quick changes I duplicated the same page and used it as a full portfolio of my photography and video work to shop to potential clients. I can't count how many times I got complements as to how the page looked and questions if I could make pages for others. You can use Spark to create graphics for social media, Pages for web journals/portfolios/anything you can think of, and even video content with its on editor. Bottom line this is a great application for content creators and multimedia people who either don't have a ton of experience in the creative suites (Premier, Photoshop, Final Cut, Illustrator, web coding, etc.) or those who have a ton of smaller projects to shoot out and need it done quick. The best part is how affordable it is. $10 a month pay as you go or $100 for a year for the full plan and they even have a free option that allows you to use most of the features of the program to test it out. The free plan doesn't expire so if that's all you need definitely give it a try! So far nothing. Adobe support for this product has been great and they have been growing and expanding this since they have released it. Excited to see whats in store for the future. Give it a try and see if it is what you are looking for. I would say it has the same graphic creation abilities as Canva with the added bonus of doing web pages. Quick and easy portfolio creation. I can even curate pages specifically for different clients for my photography business. People love the personal touch and it can be a factor between landing a gig and not. Spark has also never made curating social media posts so easy. "varied and multiplatform a great mix to achieve success"
Adobe Spark is the perfect program if you need to make quick, accurate and colorful changes, it is perfect to have a control in the projects when the team is more than 3 people when synchronizing with mobile devices we can verify the progress without having to be present during the creation process directly. It is important to highlight that through this tool the work with freelancers is much lighter and usually have much faster progressions. It is totally a powerful tool, but it does not have export formats that can be exchanged between its mobile versions or Tablets and pc / mac which means that the projects have to be handled exclusively via internet, its test mode is quite incomplete what is not It allows you to have a clear idea when deciding whether the paid version is worth it. If you need to start with a program to quickly edit your posts and build feeds in less time with Adobe Spark you can do it, considering that you will have to refine your skills with other allies, but a beginning is a beginning. The synchronization is spectacular and we have to mention that being able to quickly edit between images, videos and gif is a plus, which undoubtedly accelerates the process of editing and post editing, having a whole team connected in such a simple way without the need of third parties It's quite nice, time is money. "Amazing and easy to use resource"
I stumbled upon this Adobe service/app when searching for an easy and free way to make posters. This does so much more and "Sparks" creativity when playing and trying to make posts, flyers, ads, videos, etc. I love all of the graphics offered, free pictures or ability to upload, color options, and fonts/formats.It's also easy to download a finalize version and use once complete! I wish I had found this ages ago! Honestly, I have absolutely no complaints about Adobe Spark. Absolutely love it and use it often- for both work and personal projects. Try it once and you will be hooked to its possibilities! I use Adobe Spark to create easy and visually appealing posts/graphics. It helps to market certain projects and events with easy to make flyers and posts that I can add to emails. I love this program because it gives you the options between creating something completely from scratch, or you can input your logo and primary colors and it gives you all sorts of great options for different ads. I also really like that it gives you the exact dimensions for any different social media platform, as well as any kind of advertisement that you might be looking to do. Sometimes it is tough to figure out how to replace parts of the ads with the exact things you want. But if you learn to work around the different areas, you can do it. It just takes a little trial and error. This is a great way to help you build advertising on your own for all the different platforms, whether it be email, social media, or even printed material. 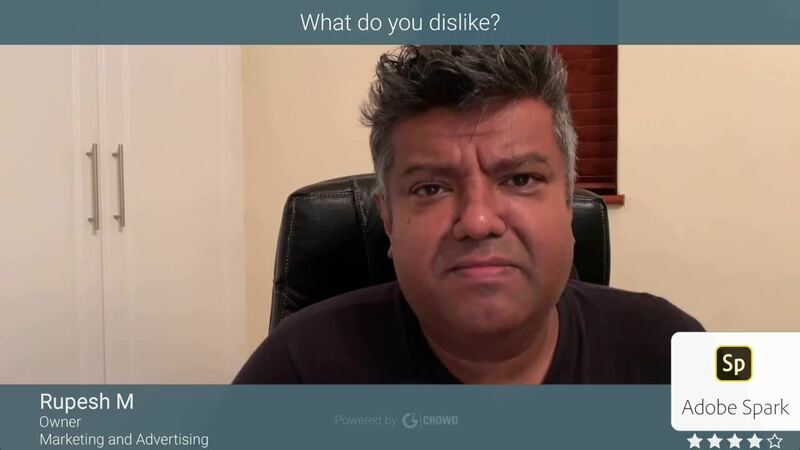 I have been using Spark to help build ads and photos for our social media platforms, which has helped us to reach a more broad audience, and has helped us get the attention of our followers on each platform. "Spark makes it easy to create professional quality photo and video presentations "
Compared with other Adobe suite products, Spark is extremely easy to use. A kid could get on and create something without training. It’s also free! It’s a bit limited. It doesn’t allow you to insert YouTube videos or anything like that, only video uploaded from a file. Slide templates are pre-set as well, but all of this allows it to be used easily by all. We’re using Spark for photo slideshows that can be embedded into the body of our online stories. We had been using another free program, and it was undependable and time consuming. With Spark, creating a photo slideshow only takes a few minutes. "It does what it's supposed to do for the most part..."
I like the random font & color generator. I also like the different kinds of fonts, effects and shapes available. It's very easy to navigate tools. I disliked the fact that when you add an image, it creates a sort of block on the picture. It does not allow you to add layers, or put one picture on top of another per say. I also don't understand the point of the primary and secondary font styles. I am solving promotional needs by having the ability to create cover arts and flyers for my personal businesses. It's a great design tool for non-designers. I have very limited Photoshop skills, but I find this so easy to use, and it has a wonderful library of stock photos and icons to choose from. It also can auto-brand things so you can easily make social media graphics, print docs, website headers, basically whatever kind of graphic. Really enjoy the auto-size functionality too. Lots of great templates and easy way to try different colors and fonts and stylings. Not great for complex graphics like charts and infographics - at least, I haven't found the right way to do that kind of stuff here. Definitely try it out if you struggle to use Photoshop and need to turn around quick, high-quality graphics for marketing materials! Quick graphics that don't require me to go to a graphic designer - specifically website and social media, signage for events etc. All on-brand. "Has potential but could be improved"
I definitely appreciate the effort Adobe has put into creating this software. It makes designing social media posts so much faster and simpler. The selection of fonts, designs, and color schemes is great, especially for people who may not care for graphic design too much. As great as the software may be, it's only a start. It could be improved with additional fonts, graphics, layouts, and color schemes. Perhaps even the support of your own fonts, too. Additionally, the stability of the web app is abysmal. The last time I used this, the project I was working on would not save, even after a couple hours of work. When I tried to download the file, it would not do anything and ended up not responding. I went to the previous page and nothing saved. Two plus hours of work turned into nothing but frustration. If you do not want to spend hours using Photoshop or Illustrator to design something, or if you don't quite know how to use either of those, this is for you. If you normally use either of those programs, this web app/software may frustrate you and leave you wishing it had more to it. For social media marketing purposes, this is the perfect tool to create stunning and aesthetically pleasing images. For anything that requires more than an hour of work, perhaps it would be better to use Photoshop, Illustrator, or InDesign as those would be more suitable. "A simple suite that makes it easy to create nice-looking, shareable content"
I have been using Spark to create web-based pages that I can share in client presentations and then send as a link either directly or embedded within my our website so it stays in our domain name. I like how easy it is to create flowing, very nicely-presented pages that look professional and well designed, incorporating our brand elements. The feature set and customization is quite narrow, but I can't fault it too much for this, because it's purposefully simple. The one thing that bothers me quite a bit is that, despite being a paid Creative Cloud subscriber, when I create a page there is an "Appreciate" link at the bottom added by Spark that I find a little unprofessional looking. When I searched online for how to deactivate this, all I found was others with the same complaint. I found Adobe Spark when I was looking for an easy way to present a combination of text, images, and videos in meetings. It has a good trade-off between easy of use and elegant looks with limited customization. This one has so many features that I love and use on an almost daily basis. I am in love with this product. If you are in need of a common theme throughout your posts and in need of creating something based around the same brand, this is the medium to use. It creates everything based on your brand and logo. You can upload a logo and use that logo on any post you create with the touch of a button. I dislike that the actual "Brand" Page seems very bland to me versus just creating my own. I do wish there more so many more options as far as seeing my brand on all the templates instead of just a select few. I recommend that you fully delve into all the features. Create a brand/logo and have it ready for upload. This will be the logo you can place on all of your images for posting. I am able to create all my posts in one place! This is wonderful so that I am not having to hunt down posts or have to go back and edit them from file. I have been implementing Adobe Spark in our Company's presentations over the last few months. We needed a break from the standard and somewhat boring PowerPoint presentation. After designing the first presentation, not only was our President very happy with what I was able to create for him. At our first presentation, the client stopped us in the mid-presentation and asked: "What did you guys use to make this"? They were blown away by what we had created! The platform is too simple. If that is actually something to dislike... While we understand that it is a newer application by Adobe. It needs more features soon before this too gets to be outdated. Use this product to create short, scrolling, one-page website styled presentations. We are strictly using this application for creating short presentations and taking advantage of the "GlideShow" display option. "A quick way to build narratives around projects"
Spark is incredibly easy to use. However, it produces catching presentations, which could be used to show projects and plans in a very effective way. Just choose one of the templates, put in text and pictures, and the presentation is done, with nice motion effects, parallax, and much more. Moreover the app is accessible both from mobile platforms and a web-based interface on desktop and laptops computers. This kind of ubiquity amplifies its potential uses. Simplicity comes at a cost, in this case the limited set of templates supplied by Adobe. In spite of this, the templates cover a wide range of styles, allowing everyone to put together a nice looking presentation in a very short time. Another limitation is that the presentations stays on a web space provided by Adobe, although it could be shared quite effectively from there, even as frame. If you need a fully personalised web-content, Spark could not be for you, since it relies on predefined templates and Adobe's web-hosting. If you need to quickly build narratives and show them in a reliable way, Spark is without any doubt a choice to consider. Its ease of use is also a great advantage in using it. It helps in producing narratives, a great part of a creative effort in these days. They can be used for everything, from explaining design concepts to showing the contents and benefit of courses. Being hosted by Adobe, the presentations are always easily accessible online. "Adoabe Spark! Great product for any business." It is easy to use. I can make more complex designs, and my colleagues can make more simple designs when I am unavailable. I dislike the limited number on fonts. Sometimes I wish there were more advanced features as well. If you are doing advanced graphic design this is not for you. However, I think this is perfect for everyone else. We use it for posters, ppt slides, infographics, social media posts, and much more. Everyone on staff can use it regardless of graphic design knowledge! We needed something that everyone could use to create promotional materials for events, programs, etc. this the was the perfect option for us. It is also free, so we are able to mitigate costs by using this program. "Easily create nice looking online stories with no headaches"
The ability to create rich diverse slideshows with no coding knowledge is invaluable. The fact that anyone can build a nice looking page in seconds. Dont expect the product to be the holy grail and fit all your needs. It is limited for a reason, it means real novices cannot mess up a nice looking layout. Also don't think Spark can replace a website, its not for that it allows brands/people to tell a story online in a visual way. We use Adobe Spark to quickly build highlights pages of our events immediately after they finish. Before this was a laborious task of designing and coding. Now our PR guys build them on their own. As i am a creative cloud member Spark is included in my package so it also saves the company money as we don't have to get any other 3rd party software or subscriptions. I truly see this as a free perk for Adobe CC. "Spark is great for quick videos but the variety is limited"
Spark is super easy. I can upload photos or video snips and it makes them look great. This is an invaluable tool for me and the fact that Spark is FREE makes it that much better. As an Adobe Creative Cloud member I get the Spark enhanced account for free. The fact that I can knock out a video in 5 minutes and it looks is absolutely invaluable. What I dislike the most about Spark is that the templates are limited so most of my projects look the same. I'm also limited in the ability to resize text , other than typing more letters to decrease the font size. I should note that I don't use the web builder or graphic design tool much so I won't comment on them. Try it! It's fun and super easy to use! I post a lot of marketing videos for digital marketing and seo for myself and other companies. This makes it easy to process a few videos in a single day. Otherwise, if I were using Premiere Pro, it would probably take me a full day per video. "A good app for quick and beautiful collages"
I love how easy it is to remix existing layouts and make them completely your own. The app works seamlessly with creative cloud so I can easily view my projects on all my programs/devices. There is also a very well-integrated selection of royalty free images and patterns which takes the guessing out of using images. The app makes it easy to customize type and get the exact esthetic you want with just a few taps. I don't have much to complain about with Adobe Spark. The only thing is that I wish it was a little easier to save settings that I use frequently like creating custom templates. Definitely utilize the existing templates to get a head start on projects with quick deadlines. I've found that Adobe Spark makes quick projects quicker and more efficient without letting the design suffer. It makes creating social media posts and graphics more streamlined and simple to manage. You can share to social media right from the app! "Easy, fast, and professional looking!" That I could make videos quickly and easily, and add things like different themes, music, etc to get the exact look and feel that I was going for. It was also insanely easy to use! I was going to teach myself Premier Pro, but was worried about how long it would take to grasp it. This solved my problem with that quickly and easily, while looking professional as well as insanely user friendly. Now I can create videos for my company while I learn Premier Pro, and they still look professional and polished! The music addition is probably my favorite part, they have such a good variety! Nothing! It was easy to use, very user friendly! Perhaps add more themes? That is literally the only thing I can even think of that I was not 100% happy with. I also wish you could change the transitions from slide to slide without hanging the entire theme of the piece, that would be useful. So, two small suggestions to an otherwise stellar program/service. A quick and easy way to make videos and brand your business without having to know how to use all of Adobe's products. Making quick videos with photos and property information for our just listed/open house announcements while teaching myself Premier Pro! The benefits are obvious, they make quick work of what I imagined would be a long and difficult project, I was so relieved to have found it! "I feel like a professional video/photo builder..."
Adobe Spark is wonderful for beginners that aren't video-making savy, as myself. I love the step by step it offers. At times I find it difficult to edit an already saved photo, but this is very minor. If you are a beginner in video producing this program allows you to put together wonderful projects! I just recently discovered Adobe Spark through my daughter's school. They posted on their social media accounts projects they had created using this program. So, I thought I would see what it was all about. Love the user friendliness of it! "Adobe Spark—A more accessible design tool"
Adobe Spark brings some excellent design resources to the table for creating social media graphics. It does a lot of things as Canva does, but image resizing and layouts are much more flexible. The ability to instantly change between optimal sizes for platforms like Pinterest, Instagram, and Facebook is convenient. The available color palettes are a bit difficult to see when applied to most of the designs. Since you can create your own custom color palettes, this effectively eliminates the issue. I recommend using something like Coolors or Paletton if you're looking for color inspiration—the palettes are limited and there isn't much of a library to choose from. A user-generated library would be neat. All things considered, Spark is a wonderful design tool. However, the free image search seems like a bit of a risk, since it pulls from "websites like Google, Flickr, 500px, Pixabay, Unsplash and the Noun Project." Some of these do not have clear licensing on their photos and may not be licensed under CC0, meaning you may not have permission to use them or have to attribute whoever owns the rights to these images. The biggest thing for me, personally, is the ability to quickly create quality social media graphics. Spark simplifies this process and reduces the time you spend creating graphics. Spark can make your presentation pop! Even if you’re not a “techie” person you will definitely love Spark. You can’t port Spark to its own domain. So if you want to make a website with Spark there seems to be no way to download the site and add it to your own hosting. With Spark you don’t have to be a web coder to make things look beautiful. The learning curve is relatively easy. Presentations look perfect. Presentations are more lively, professional and uniform. I can quickly put something together and it looks great, flows perfectly and is in web form, so it can be accessed easily. It’s also easy to teach others how to use it. "Doesn’t do everything I can think of "
I like all the options for design, the trendy stock photos and images, there are so many possibilities that the program offers. Also, being an app, I can work from anywhere to make a quick graphic for the social media accounts I manage. The video making feature could definitely be developed more. There aren’t that many animation options and the video slideshow feature is pretty limited in what it can do. Also, as a new user, it isn’t super user friendly. It takes a while to understand how it all works. I can’t carry photoshop around with me, so when I need to create a quick and easy but professional graphic on the go, this is perfect. Also every social media format is available, so you don’t have to figure out the sizes or change any settings. And it will automatically reformat your graphic for any platform so it cuts out a lot of the setup or retinkering work. It's free, no really. What I like best is Spark gives you the ability to stand-out in an instant since it allows for beautiful animated videos, resizeable graphics, and even web page creations which we utilize for our social presence. It's also a web-application, which is super essential for on the go travel and not taking up a lot your computer's CPU! I don't like that the only interface is via the web, while that makes travel easy it also can make it difficult when you don't have access to the web, or want to work on something and need you don't have the ability to use it. We're currently working on our social media presence, which this application has been really intuitive for! It's quick, easy, straight-forward. I love the idea of being able to create more flexible and creative social media posts and having some way to more robustly control photo orientation, text, typefaces, etc. Social media postings and creating more robust and creative content than what native apps provide. It offers some nice ideas on templates and creative layout solutions but if you want to create your own content, it's harder to navigate. "Get this now. It's incredible." I'm a user for a substantial number of adobe products, and Spark is my absolute go-to program for graphic design, video, and splash landing pages. This program is literally revolutionary, and I will sign its praises to anyone who listens. This is an absolutely incredible program. The graphic design is intuitive, simple, incredibly mobile-friendly, and increasingly flexible. It is literally drag-and-drop, a few sliders, and minutes later you can have professional-quality design. Videos are similarly easy, though less flexible, and splash pages are a delight. The team working on this is fantastic, and committed to shipping new features that users want - so some of my nitpicks will or already have been addressed. Finally, a HUGE bonus is their branded version of the program, which puts your logos, colors and fonts together and spits out a ton of useful templates to start from. I literally cannot speak highly enough about this program. Splash pages are hosted on adobe right now, and cannot migrate to their own domains. Branded templates still don't have importable fonts, so if you have a non-standard font with your brand, it is a less useful feature. Cannot reccommend this product any higher. It is truly stellar, the price is incredible (free for basic use) and it's the future of simple design in many ways. We create quick designs, short videos, and simple splash pages with this, and we're disseminating the ability throughout the organization to empower non-designers with simple tools to make beautiful things easily. 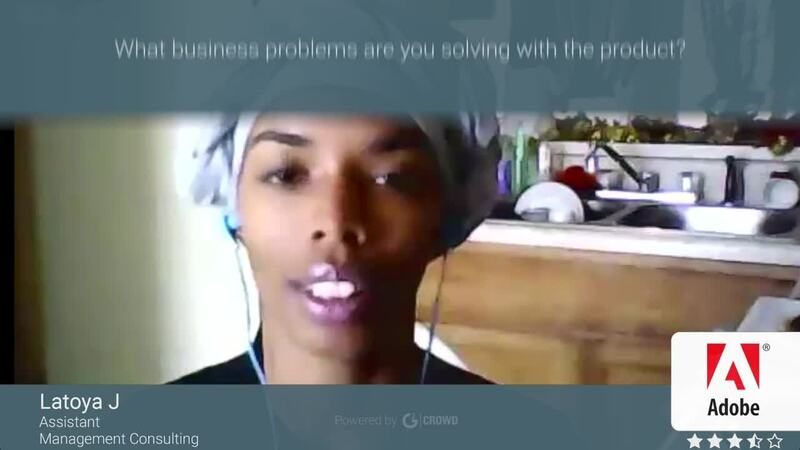 "My favorite online tool for social images." What I like best is that Adobe Spark is so easy to use--and it seems to provide the most modern look for social images. I use it to create social quotes, announcements and even videos. It's comparable to other brands when it comes to price and I just think the delivery of materials is better. More than anything, I wish it allowed a business to give "seats" to other people in the business so remote employees could go in and create images for you. While there are a lot of competitors out there, I believe Spark produces the best, most modern-looking results. I'm able to create images faster than ever. No need for Photoshop or other graphic design tools. It takes care of it all. * We monitor all Adobe Spark reviews to prevent fraudulent reviews and keep review quality high. We do not post reviews by company employees or direct competitors. Validated reviews require the user to submit a screenshot of the product containing their user ID, in order to verify a user is an actual user of the product. Hi there! Are you looking to implement a solution like Adobe Spark?